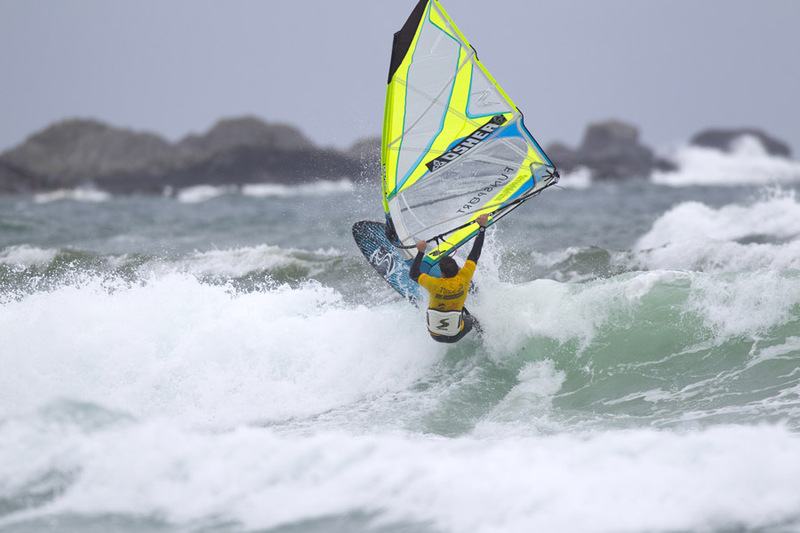 The 2013 Tiree Wave Classic is just around the corner, the event kicks off on the 12th October and runs until the 18th, with a whole host of amateur, youth, master and pro wavesailors heading to the Hebrides. The 2013 contest is all about the amateur fleets and helping everyone progress their windsurfing through fun competition, clinics, coaching and more. It looks like there is good wind coming through the week with a range of conditions and beaches coming into play! There are still a few places left on the Friday Ferry with Calmac but the Saturday is booked……though you could hedge your bets on the forecast and land Sunday so long as you pre-register online and email jim@puravidaboardriders.co.uk to let them know you are on your way!! All competitors are being given the opportunity to get involved in a series of clinics that will be run by pro sailors such as Ben Proffitt, Phil Horrocks and Andy Chamber, as well as top sailor and head judge in Tiree, Mark Hosegood (Duncan Coombs will not be attending due to the potential of RBSC competition). The focus will be on helping aspiring wavesailors improve and enjoy themselves, whilst getting great results in the contest! There will also be lots of demo gear on offer from the likes of: Nik Baker (Fanatic/NorthSails) Ross Williams (Gaastra/Tabou) and Jim Brooks-Dowsett of Puravida with their big demo van. You can not only try out the new gear, but if you find something you really like you’ll be able to use it in the contest too! This year, the Tiree Lodge Hotel will be HQ for the event, providing the sailors with a central hub during the day, socials in the evening and of course a great last night party and prize giving, which will include entertainment from ACDC cover band Forever Young. Every entrant will get the ‘Tiree 27’ limited edition contest rash vest too! the ‘Crepe Shack’ will be feeding us again at the beach each day promising to stay and cook as long as the competition runs each day!! RYA Scotland are also involved this year, providing more exciting approach to youth windsurfing. In 2012 they brought over a group of youth windsurfers to meet the pros, but now these young sailors will join the BWA in the youth wave contest too. The BWA youth fleet will be judged by the pros as a taster into the contests, we cannot wait to see how they all get on! In pro news, of course all the top boys will be there fighting it out for the title, but they will also be joined by the international guests including spanish PWA ripper Albert Pijoan – will there be any more international riders to join and cause an upset? The prizes are coming thick and fast from O’shea, Aeron (new boom for youth competition), Maverix (new mast), plus there’s a £1000 prize for the first placed pro, making it the biggest prize fund on the UK tour! To top this off the most coveted trophy is perhaps an engraved Scottish Broadsword for the champion!! A final word goes out to Wild Diamond who will again be helping organisers Puravida Boardriders with all the event logistics. We look forward to seeing you all in Tiree very soon!